National Honor Society is hosting its annual senior vs. staff basketball game on Wednesday, March 20, during seminar. Students can buy tickets for $3 to get out of seminar and watch the game. Ticket sales will be during lunch on Monday, March 18 and Tuesday, March 19. All of the money from ticket sales will go to Mrs. Cyphers to help with ongoing medical expenses. The game will start around 9:50 and go until 10:30. There will be a short half time during which the dance team will do a boy-girl dance. 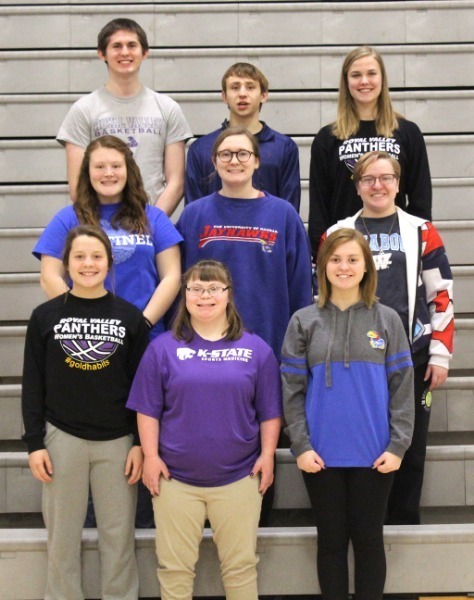 Representing the Seniors this year are Emily Albright, Mary Broxterman, Pak Hale, Menon Iriving, Kobe Mills, Benjiman Nuener, Tope Serna-Blakemore, Kiikto Thomas, and Kalijn van Hemert. Representing the staff this year are Coach Boucher, Mr. Broxterman, Mrs. Clark, Mr. Katzer, Coach Keller, Coach Lott, Coach Pfannenstiel, Coach Porter, Mr.Schooler, Mr. Smith, and Ms. White. Click on the links below to view the Royal Valley High School NHS Constitution and the selection guidelines.